China always thinks big. In 2014, when we first started writing about China’s plan to build a New Silk Road along the centuries-old trading routes, it was little more than a bold idea. More than three years on, what has come to be known as the Belt and Road Initiative (BRI), is being billed by President Xi Jinping as “the project of the century”, encompassing almost two-thirds of the world’s population and 29% of global GDP. But the country’s leadership also wants this ambitious plan to be economically sustainable and environmentally friendly. Railways, highways, airports and infrastructure: The BRI aims to increase infrastructure investment and promote cross-border trade to ensure that goods, services and capital can flow easily on land (the “belt” connecting China, Central Asia, Russia and Europe) and sea (the “road” linking China to ASEAN, India and Africa). This presents an historic opportunity to not only provide much-needed infrastructure in the form of transportation links and energy systems, but also to ensure it is directed along an environmentally sustainable path. We look at the economic logic of this ambitious project, and the available funding approaches. Green belt, green road, green infrastructure: Infrastructure should be designed to last. Climate resilience is important as evidenced by the extreme events of the past year, where Munich Re expects insured losses to be the highest ever. At the same time, we think infrastructure should be built in a way that avoids carbon lock-in. Since these structures and systems will maintain their emissions profile for decades, their emissions should be low, in our view. The UN’s Sustainable Development Goals are also giving new direction to financiers as they fund large infrastructure projects. Infrastructure must be financed and we believe green financing has an important role to play in the transition to a lower-carbon future. The signs are good – President Xi has offered strong policy support and Chinese banks are beginning to issue BRI-focused green bonds. For financial instruments such as bonds, loans, insurance and securities, explicit “green labelling” signals a commitment to sustainability to the outside world. If “the project of the century” is to be climate-resilient and sustainable, we think it should also be ‘green-financed’. Infrastructure systems are the lifeblood of the economy. Energy systems power homes and factories, transport systems get people to work and water systems maintain good health. Transport, power, telecommunications, water supply and sanitation all play an essential role in increasing living standards and trade, GDP and consumption. It is a virtuous circle – infrastructure investment drives economic growth and, in turn, economic growth drives further infrastructure demand. And the need for quality infrastructure in Asia is increasing every year. The Asia Development Bank (ADB) estimates that developing Asia will need to invest around USD26trn from now to 2030 in order to maintain growth momentum, eradicate poverty, and respond to climate change. That is more than double the ADB’s estimate in 2009. To put these numbers in context, the region currently invests an estimated USD881bn in infrastructure annually, about half what is needed, according to the ADB’s estimate. Ambitious plans are already in place to narrow the funding gap and the BRI is leading the way. The first time the Belt and Road Initiative was mentioned was back in September 2013, when President Xi announced his ambition to revive the routes along the ancient Silk Road during a visit to Kazakhstan. More than four years on, he took the opportunity to highlight the importance of this grand plan during his speech that opened the 19th Party Congress in October 2017. Last year, at the inaugural Belt and Road Forum in Beijing in May 2017, President Xi announced an additional USD136bn of funding support for BRI-related infrastructure projects (Table 1). At the financial integration session of the forum, the People’s Bank of China (PBoC) governor Zhou Xiaochuan stressed that funding of projects related to the BRI should be raised through a market oriented, sustainable and mutually beneficial investment and financing system. 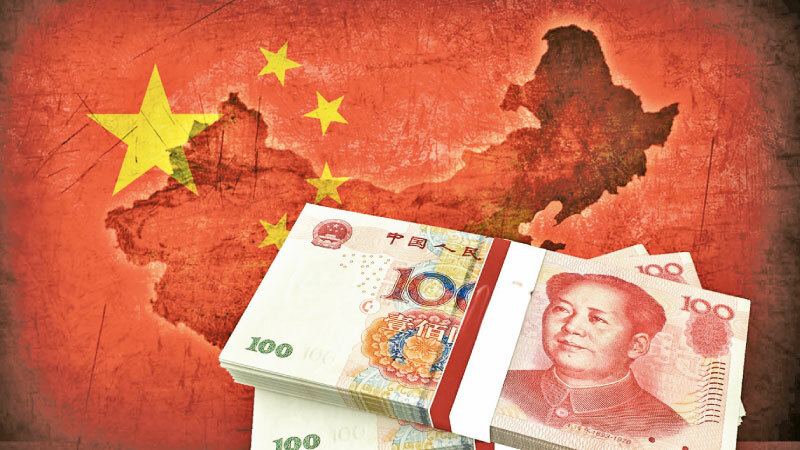 Although not directly related to infrastructure spending, China has vast quantities over foreign exchange reserves, which have been building up since its ascension to the World Trade Organisation in 2001. They have come down from their peak in 2014 but are still large at around USD3 trillion. The size of these reserves indicates China’s ability to tap capital (should it be necessary) for long-term use and without worrying about rate volatility. 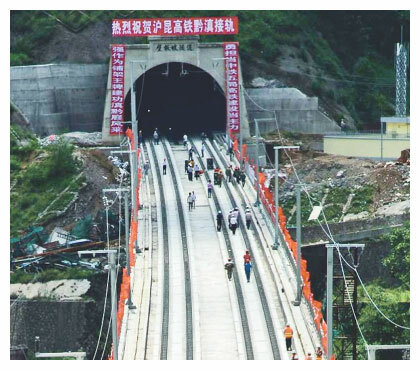 China has been building up its domestic infrastructure for many years and this, coupled with reserves, can be considered as “national savings”. As China gradually lowers its domestic investment in the future (as the economy matures), these reserves provide a back-up supply of capital for global infrastructure spending if ultimately required. Overseas spending by China has grown in recent years as more people have been brought out of poverty to join the ranks of the middle class. China now accounts for roughly a fifth of global outbound tourism, double that of the US. It shows the increasing appetite for Chinese to look outwards, both on a more individual level as well as nationally. Infrastructure spending will facilitate further overseas investment and support sustained consumption growth in the future. The rise of the ‘green’ agenda domestically in China has been swift. The country is the world’s largest greenhouse gas (GHG) emitter in absolute terms and has, in recent years, come to embrace its important role in achieving the international goal of limiting global average temperature rises to within 2°C through the Paris Agreement. The carbon intensity of its economy has fallen steadily since the start of economic reforms and the opening up of its economy in the late 1970s. 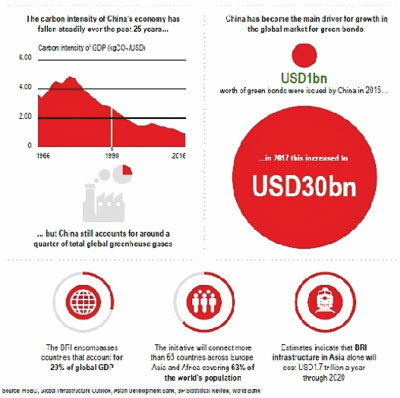 China now emits 73% less carbon dioxide per unit of real GDP than it did 35 years ago. However, it still accounts for around a quarter of total global GHGs. Domestic environmental-related targets were first incorporated in the 11th Five-Year Plan (2006-10). Since 2013, the legal, regulatory and institutional framework for environmental protection has been expanded widely through new laws and regulations. We think China’s medium-term environmental targets, which include emissions, energy intensity goals, and specific pollution reduction, are achievable. China is also accelerating the implementation of policies for specific industries and regions. For example, it already has several regional carbon trading schemes up and running and launched a national trading scheme in late December. In the coming years, we expect continued development in climate and environmental policies to address the transition away from China’s dependence on coal, the country’s ongoing ‘war on pollution’ and its growing leadership on the world stage. As China’s reach and influence grows on the world stage, we think there is an opportunity to showcase green leadership abroad as well as at home. Besides being the world’s factory, and increasingly the world’s innovator, China’s endeavours abroad can have a significant influence on the trajectory of global emissions as well as its overall environmental footprint. China will conscientiously perform its due international obligations and responsibilities, keep its promises on global climate change, actively push forward the implementation of the Belt and Road Initiative President Xi Jinping, New Year address to the nation, 31 December 2017. 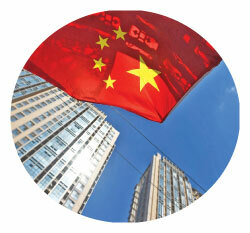 As China looks more outwards, it is looking to be a leader in sustainability. Success at home – in renewable energy capacity and improving energy efficiency, in world-class infrastructure and public transportation – can be replicated abroad. China’s reach in Asia Pacific, but also the major trade routes of East-West and South-South, afford it the opportunity to be a part of the growth that will affect two-thirds of the world’s middle class. Many financiers do not take into account climate considerations when providing capital – they merely supply capital to projects consistent with their risk-reward profile. For those that do consider climate change, many do not explicitly label the project as being climate-aligned, related or resilient. We think the explicit signalling of the ustainability considerations through more transparent labelling is important because it indicates the direction of travel – towards a lower-carbon future and a more sustainable world. There are signs that this is changing. Infrastructure should be designed and constructed to last. However, infrastructure systems designed for current norms or historical patterns of usage, wear and tear may not be sufficiently prepared for the future. For example, climate change may bring such variations of future wear and tear that are outside the boundaries of current planning – this is why embedding climate resilience is important. Also, sustainability considerations should take into account the full lifecycle of the asset. 2017 was a year when the importance of addressing climate change became clear. Extreme events such as floods, storms, and wildfires caused physical and social devastation across many parts of the world – the severity of these events was magnified by climate change. Rising temperatures affect the severity of nature’s extreme events since there is more energy in earths many systems; over the longer term, the effects can be felt through “slow-onset events” such as rising sea levels. The Intergovernmental Panel on Climate Change’s (IPCC) Fifth Assessment Report (AR5) goes into detail at the possible impacts across the world. As such, we think infrastructure should be embedded with a higher level of climate-resilience – that is, a higher risk tolerance to more severe extreme weather events. This cost to embed a higher risk tolerance is most likely going to be slightly higher than building with standard risk tolerance – all other things being equal. However, over the longer run, we think preparation by resilience is more cost-effective than rebuilding post disaster. Infrastructure is usually designed to last many decades. Over the long term, we believe avoiding high carbon lock-in is important from a climate perspective. This is particularly true for energy infrastructure, where power stations can operate for over 40 years. Notwithstanding high-cost retrofits, the emissions profile of infrastructure is likely to remain fixed throughout its lifetime. Thus, a high carbon asset is likely to remain a high-emitter for 40 years. When the differences are accumulated across the world, over a long time frame, the incremental emissions can be very large indeed. In our view, these emissions can be avoided by choosing infrastructure that utilises newer technologies, embeds more efficiencies and embraces more sustainability. There is also a growing consensus that the construction and operation of infrastructure systems should be sustainable – that is, not cause (any or further) degradation to the environment, or those that depend on it. This encompasses the earth’s atmosphere, the quality of the air, the surrounding waterways, the quality of the land as well as the ecosystems and livelihoods that depend upon these. A healthy environment contributes significantly to the steady and healthy growth of an economy over the long term through, for example, stable and reliable systems and a healthier and more productive workforce. HSBC also see more linkages with the UN’s Sustainable Development Goals (SDGs), adopted in 2015. These goals cover 17 different areas of sustainability, comprise of 169 specific targets, and are to be reached by 2030. A number of these relate specifically to climate change and the environment. In our view, the infrastructure to be built under the Belt and Road Initiative should also embrace these issues. Sustainable, low-carbon and climate-resilient infrastructure and systems still need to be financed. Investors tend to look for an appropriate balance between risk and reward. Historically, high-carbon investments were seen as lower-risk, with higher reward than low carbon investments. However, we think this is changing as low-carbon technologies grow more mature and, perhaps more importantly, as the risk profile begins to invert. More financial institutions are beginning to shun higher-carbon activities in favour of lower carbon activities. For example, the World Bank will cease to fund oil and gas exploration after 2019; some firms are pulling back from investing in oil-sands; and many financial institutions will only provide funds to coal-fired power generation under special circumstances. Green bonds have seen strong growth over the past few years, to over USD129bn of issuance in 2017, according to HSBC calculations. These bonds are essentially standard financial instruments except that the use of proceeds are designated for green projects. Different countries adhere to different standards i.e. what constitutes green or mandatory ring-fencing, but we think the important aspect here is that the bonds are labelled as green. This signal is helpful to investors, other businesses and governments in terms of a commitment to sustainability. Furthermore, we think disclosure and transparency are very important for the sake of environmental integrity. China’s green bond market is among the largest in the world and the growing appetite for this investment category is obvious. 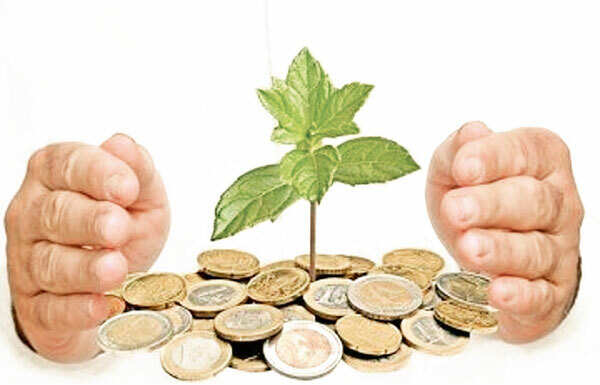 The country has become one of the main drivers of growth in the global market for green bonds. Around USD30bn worth of Chinese green bonds were issued last year – over one-fifth of the global total – and up from just USD1bn in 2015. Infrastructure is important to the smooth running of economies, and increasingly the global economy. There is still a lot of investment opportunity in this area as global infrastructure development will require trillions over the next decade or so to 2030. Sustainability or environmental considerations are very important from a design, construction and operational viewpoint over the entire life of the asset and beyond. We think the various financing options available for these projects could tweak the level of sustainability embedded within them. China’s Belt and Road Initiative is an important confluence of all of these themes given its vast reach, its vast scale and its ability to shape global contours in years to come. Whilst green finance can help spur investment in green assets, we think it is important to consider the environmental integrity, impact and climate resilience of these assets. We think a broad range of green financing tools and the appropriate regulatory policies are necessary to embed sustainability into “the project of the century”.